The hallways of math and science history are overflowing with the achievements of white men, from Sir Isaac Newton to Steve Jobs; their faces are printed into elementary school textbooks everywhere, and their achievements have been indelibly drilled into our minds, with countless awards and institutions named after them. To be brilliant is a gift, but who gets to be remembered as such involves privilege. As the recent Oscar-nominated film Hidden Figures notes, so many of the “hidden figures” of mathematics are black women, whether they helped America put the first man into space or are studying the awesome power of dark matter. While it’s incredible—and important—to see black female mathematicians being rightfully celebrated, it’s disconcerting that it took until 2017 for them to receive the national acknowledgement a blockbuster film affords. It’s especially disheartening that almost 60 years later, black women are still woefully underrepresented in the hard sciences. There are so many hidden figures around us everyday, and we should celebrate them now—not in 20 or 30 years. 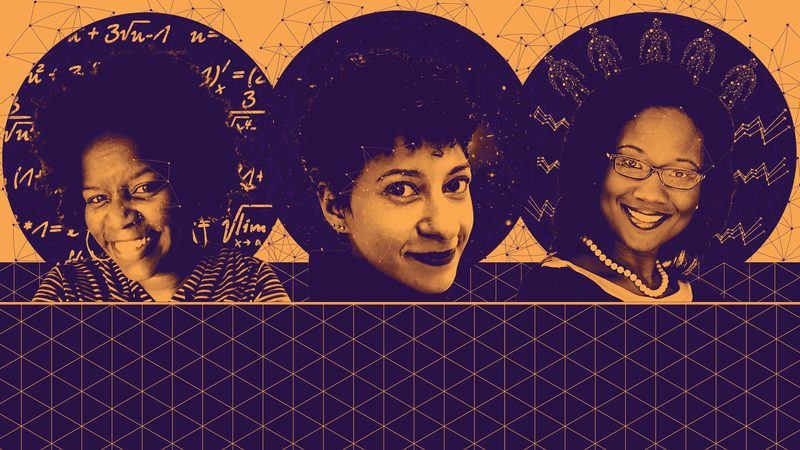 In light of International Women’s Day, we’ve rounded up some incredible black women changing mathematics and our world for the better. Dr. Prescod-Weinstein is an astrophysicist and self-proclaimed “axion wrangler” at the University of Washington in Seattle. While she currently studies dark matter candidates, her passions of math and space started early. In addition to investigating cosmology, Prescod-Weinstein is an outspoken advocate for black women and non-binary people in STEM, especially in the mathematical sciences. She maintains a Decolonizing Science Reading List that’s required viewing for any and all interested in social justice and science. Check out Gizmodo’s interview with Prescod-Weinstein on being a black woman in physics today, and why Hidden Figures is far more than a lesson in history. Dr. Walton, a Selma Lee Bloch Brown assistant professor in the mathematics department at Temple University, is an algebra wizard, whose hard work is truly incredible. During her last two years of high school, Walton started looking up ways to become a mathematics professor. With the encouragement of some of her teachers, she forged ahead. On February 21st, Walton was named a Sloan Foundation fellow, which awards outstanding early-career scientists. It’s highly prestigious, considering 16 recipients have gone on to win the Fields Medal in mathematics. But for Walton, math isn’t about awards. “I love mathematics because I spend most of my day trying to invent and communicate (new) truths,” she said. Dr. Talithia Williams is a statistician and professor in the department of mathematics at Harvey Mudd College. She’s also had research appointments at the Jet Propulsion Laboratory (JPL), the National Security Agency (NSA), and NASA. Williams is perhaps best known for a 2014 TED Talk about keeping track of our bodies’ own data, which has exceeded 1.2 million views. Her enlightening and entertaining talk discusses how collecting data on your body’s basic functions—e.g. sleep, menstrual cycle, heart rate—can benefit your health. In 2014, Dr. Williams became the first black woman to ever receive tenure at Harvey Mudd College. Turner is an assistant professor of mathematics at Loyola Marymount University in Los Angeles, California. In addition to her career as an educator, she is passionate about her research in commutative algebra. Since 2012, she has published ten academic papers on mathematics and STEM education. In June 2008, Eubanks-Turner was named Project NExT Fellow by the Mathematical Association of America (MAA). The next year, the MAA honored her again by naming her a LA/MS Section Next Fellow. Then, in 2012, she received a research grant of over $2 million from the National Science Foundation. Eubanks-Turner is a member of the Association for Women in Mathematics (AWM), which advocates for gender equality in the field. While a general interest in STEM fields has increased over the last two decades, mathematical sciences have struggled to become more inclusive, particularly to women of color. According to the US Census, in 2011, “26 percent of STEM workers were women and 74 percent were men.” That number is even smaller for black women in STEM fields, who are still vastly outnumbered by their white, female colleagues. The brilliant women featured here are a small but salient sample of those who will pave a path toward more equality in their fields. Hopefully, it won’t take half a century for them to become the stars of their own Oscar-nominated films.